Who wants Ken when you can have Hammer? 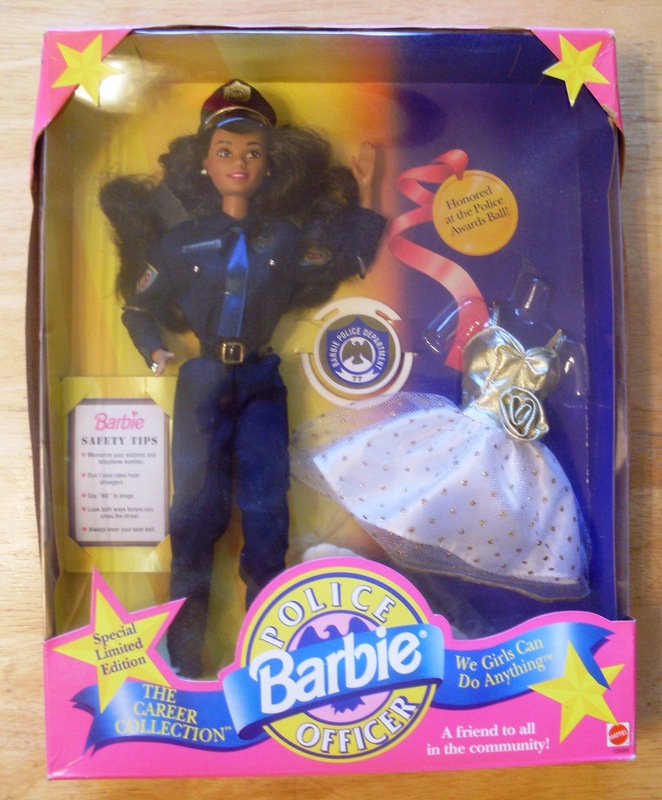 Growing up I had a large collection of dolls and Barbie dolls, a collection in which I was very proud of. I loved to comb their hair, dress them up and ride them around in Barbie’s candy apple red Corvette. (I never had a Ken doll, he wasn’t fly enough for my Barbie. I had a Mc Hammer Doll instead) Even though my collection was full of different kinds of Barbies, from Malibu Barbie to Baywatch Barbie. Despite the fact that all of my dolls held a different occupation or wore a different outfit they had one thing in common, they were black. Regardless of my mixed ethnic background I was not allowed to play with, nor did I ever have a white doll. My mother who is multiracial but bears a darker complexion always told me that just because I was a light-skinned did not mean I could identify more with a white doll then I could a black one. Even at a young age I realized I couldn’t truly identify with a dark Barbie or doll either, they just didn’t look like me. 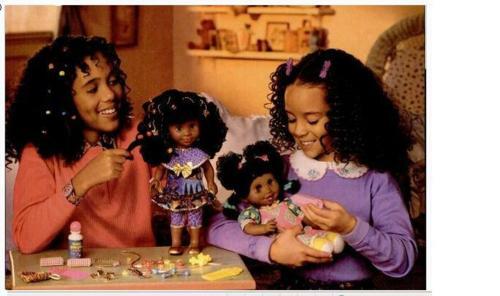 Christmas 1992 I was surprised when I unwrapped a box and there was this doll whose skin was almost as light as mine, she had big curly hair and was dressed in a kente cloth jumper, her name was Kenya. Kenya came in three different skin tones, light, medium and dark so the little girl who got her could identify with her. Kenya came with hair beads and magic hair lotion that straightened her curly hair (kind of like a relaxer which as an adult I find to be a little insulting to women of color) Each time a new Kenya doll came out I had to have her, because she looked like me. Isn’t this what all little girls want? A doll that looks like her? I asked a group of my peers (both women and men who are parents) how they felt this day and age about their daughters playing with dolls who are anything other than African-American. I received a very mixed response and wanted to share a few of those comments with you. The opinions and comments varied as great dialogue was had. My final thought was why is it made to be a big deal when a little black girl is seeing playing with white doll when nobody thinks twice when a little black boy is playing with is white John Cena action figure or his white G.I Joe? What is the difference? Does it matter that color is not what the child (boy or girl) sees when playing with their favorite toy? All they want to do is have a good time with it. Although I was not allowed to play with white dolls I was not raised to see color. 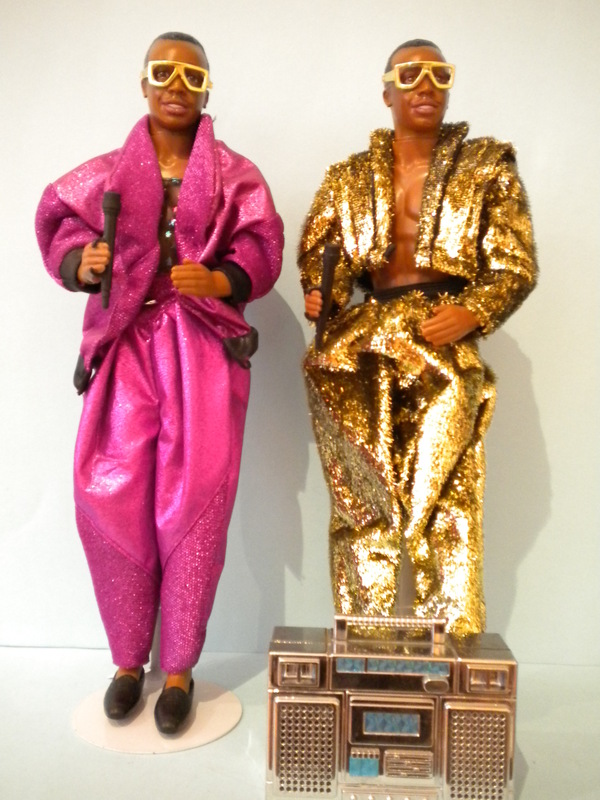 Black or white all my dolls wanted to do was party with Mc Hammer. Very interesting article hun. I’ve never really thought about this since I grew up playing with trucks and climbing trees. However, I wouldn’t care which doll I played with. But I would prefer a doll who look like me and have hair like mine. If I had a daughter, she could play with whatever she wanted. And great point about the boys action figures!